There is a sentiment that I’ve often come across in the martial arts to the effect that “all blocks are actually strikes”. If they aren’t strikes, then they are “locks, holds, throws” – in fact anything other than “blocks”. To my mind this is a modern slant brought about by a misunderstanding of how “blocks” actually work. In this article I propose to explain exactly why traditional blocks are actually (mostly) deflections. To the extent that they can be used for other purposes (in particular, strikes), these are secondary, and to interpret them otherwise is to miss out on a vast and important part of the traditional fighting arts arsenal. First, I need to get this out of the way. Yes, you can employ blocks as strikes. 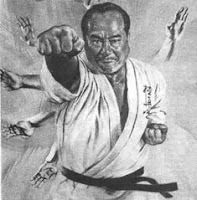 There are many situations where I would do so, and I support the general notion of “inclusive” bunkai (kata application) analysis. But there is a modern trend that goes much further than this. It not only suggests that blocks can be used as strikes occasionally. It suggests that this is their “true” meaning. In my recent article “Low blocks against kicks - are they ridiculous?” I highlight one such opinion. If you recall, the particular gentleman in question lampooned the idea that a low block could be used to deflect a kick. Instead, he suggested an absurd application involving a multiple “softening” strikes followed by an ungainly throw using a pull at the neck. All this to avoid what I think is manifestly obvious; that low “blocks” are principally used as deflections (yes – even against kicks). The gentleman in question reaches his conclusion based on flawed premises, in particular by not considering more than one type of kick (he only considers a roundhouse kick) and more than one angle of interception (he only considers 90 degrees). He also bases his conclusion on erroneous distancing. Each of these factors alone would be sufficient to invalidate his argument. Together, they paint a completely skewed, nonsensical picture. Blocks DO work… as blocks! I have previously argued (in quite some detail) that traditional blocks can and do work very well as defensive tools (see my article “Why blocks DO work”). In particular they work as deflections or parries rather than actual “stops” (ie. true “blocks”). I have also explained why traditional blocks use the forearm, namely that this often gives you your best option of deflecting a surprise attack. It does so principally by working with your natural flinch reaction to deflect attacks that have passed your guard by the time you have a chance to react. 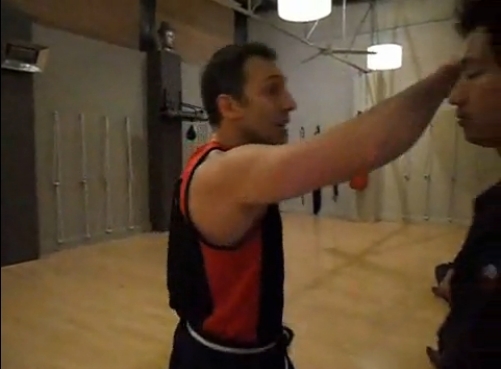 As either strike or deflection, the hammer fist requires you to rotate your forearm. Why? A “stiff arm” movement is very weak and inefficient; you have the chance, and every reason, to use the rotation at the crucial stage at which it is required. And that “crucial stage” differs as between the strike and deflection. As a strike, the hammer fist requires you to finish your forearm rotation at the moment of impact. Why? The last moment rotation gives you most of your force in what is a fairly short movement. The rotation only adds force to the blow if it is actually part of the blow. If the rotation occurs too early, then it will be irrelevant; you’ll be left with nothing more than a stiff arm strike. Nor should the rotation occur after you strike. That too is not helpful in terms of adding force. The impact has been and gone. Turning your forearm after impact is like closing the barn door after the horse has bolted. If you only start rotating your forearm at impact, you get a "grinding" action. That is because the longer contact time means your momentum is transferred over a longer period. In other words your impulse (momentum transferred) is the same, but the time is longer. F = impulse/time. Therefore the longer the contact time (ie. the "grinding" turn of the forearm against your opponent's face/body), the less the force. Think of it as the difference between grinding with a mortar and pestle or using the pestle to pound and smash things in mortar. I consider the hammer fist more specifically in relation to the issue of "torque"
The first thing to note is that your point of contact isn’t with your hammer fist – it is with your forearm. You don’t want to intercept the attack using your weak single bone – in this case your ulna; rather you want to impact using the top, flat, part of your forearm – ie. using both the radius and ulna. A strike using the top, flat part of your forearm is practically devoid of any force at all – you really do rely upon the rotation to give you enough force to use it offensively.2 Thankfully, a hammer fist used as a deflection does not try, or need, to impact hard. Indeed, it actually seeks to diffuse the impact even further. It does so by commencing a rotation of the forearm at the moment of impact. As I discuss in my article “Hard blocks”, the rotation is used to redirect the attack away from you. It does so rather than "grind" the point of contact, which the rotation could achieve if you chose the wrong angle of interception and an incorrect "striking" emphasis. a “secondary arm” (a smaller movement that acts as a backup deflection and which is sometimes called the “crossing arm”). 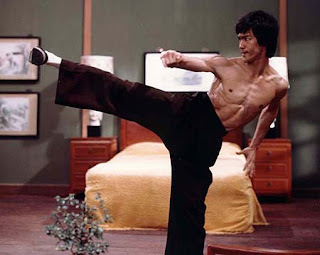 Many martial artists today utilize the secondary/crossing arm as their main (sometimes only) deflection. In practice what this means is that they are using what I call a “soto uke” – a block using the outside edge of the forearm (as it is when your arms are relaxed at your sides), but moving inside across your body. Then there is the fact that soto uke is arguably the easiest forearm deflection to understand on an intuitive level. In its simplest form it simply involves dropping your forearm! I think this is a big part of why I tend to see it used more than any other deflection in sparring, particularly between people who are not properly trained in the art of “soft blocking”; it doesn’t require much training, especially when it is used in a “hard” way (as a “soft” block, soto uke is, surprisingly, a very different beast, requiring far more dedicated study). Jodan/age uke – karate’s uppercut?! Given the above factors I am not at all surprised to hear comments such as that of my friend Marcel to the effect that “the jodan uke is karate’s uppercut”. When I first read this, I thought he might be kidding. I couldn’t reconcile the shape of the age uke, as illustrated in the adjacent images, with some kind of uppercut punch. Then it occurred to me that he wasn’t talking about the finishing position of the primary arm – he was talking about the its start. In other words, instead of being used to deflect, the primary arm is used as a strike – specifically an uppercut. And in its initial phase (ie. 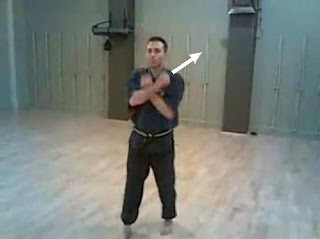 the first part of the primary movement) it does indeed start out in an inverted “uppercut-like” position. The same is true of the Naha te chudan uke; both it and the jodan/age uke start out in the same identical “uppercut-like” position. 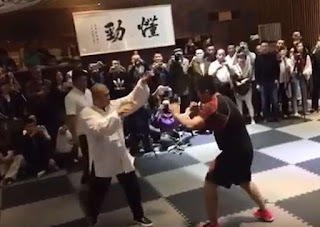 In saying “uppercut” it is apposite to note that we’re not talking about a classical boxing-style “curved” uppercut, but rather the age ura zuki – an inverted rising punch from karate and which I’ve previously covered in a separate article. The age ura zuki is indeed a very effective strike. So what’s wrong with seeing the “primary arm” from jodan/age uke and Naha te chudan uke as just an age ura zuki? Well, a number of things really. I’ll start with the most obvious – the angle. It’s all wrong! The first you’ll notice about the age ura zuki is that, like any other punch, it is angled straight out to your opponent. On the other hand, the first thing you’ll note about anyone’s jodan/age uke or Naha te chudan uke is that the “uppercut-like” movement starts out at an angle of as much as 45 degrees to the front. Why? Because that’s precisely the angle it needs to intercept an attack and deflect it. The initial phase of the deflection is critical: it must cut an angle that “wedges” into the attack. We assume the attack is on the center-line, so your deflection cuts diagonally across that line. In the case of the jodan/age uke, it intercepts with the flat, top part of the forearm, then rotates around deflecting the attack over the top of you as it wedges into it. In both cases, your “uppercut” would require substantial modification in angle to be a strike. But that’s the angle we do our blocks at anyway! First, your jodan uke will follow a very strange path indeed – starting out as an uppercut and then morphing into a largely ineffective, elbow-flaring “hook punch finish” at forehead level. Second, it’s no use saying that this finish is still capable of being applied as a head-level deflection. For a start, your angle of interception will be woefully inadequate to the task; your fist will stay (at best) on the center-line, leaving one side of your body totally unprotected. While this sort of block might still work on the inside, it is far from ideal even for this purpose because you really want to be raising your elbow – and hence cutting a diagonal line rather than a direct line – a bit sooner. In any event, let’s face it – we all know that it is far, far better to be on the outside of a punch. And on the outside this strange hybrid uppercut/block is totally ineffective, as I demonstrate in the video below. In other words, a straight line punch just won’t do if you’re using your jodan/age uke as a deflection. This is another comment I anticipate. The problem here is that we aren’t talking about some sort of arcane, multi-faceted movement like goju’s mawashi uke (roundhouse block). We’re talking a garden-variety rising block, that is being “reinvented” as we speak (see my article “Reinventing the wheel: back to the rising block”). It works. It doesn’t need to be “reinterpreted” as an uppercut punch, a lock or a hold or anything else. It is supremely useful as a deflection. I demonstrate the traditional mawashi uke – which is open to a number of applications that aren’t immediately obvious. It’s hard to see why a much simpler technique requires this sort of analysis. And apart from anything else, karate already has a perfectly serviceable age ura zuki in many kata (seiunchin and naifunchin/naihanchi are just 2 such kata). There simply is no need to “see” it in one or more blocking techniques. If the old karate masters had really wanted to put uppercuts into particular kata movements instead of rising blocks, don’t you think they would have done so more clearly? I simply don’t adhere to the concept that they were “hiding” the true techniques – at least not to this extent. Because if they were, they would have had to manipulate a perfectly good uppercut into a fairly average block or vice versa, just to carry out this “subterfuge”. “But,” I hear you say, “I can still clearly see how an upper block can become an uppercut and vice versa – so what’s the problem?” Indeed. There is no problem with this. But we’re not where we started. Now we’re talking about something completely different: conversion from one technique to another. If you ask me, what’s really going on here is a process of “conversion”. Yes, it is possible to convert one technique into another. You can do so at any time, but it is particularly easy to do at the start of a basic technique. So, a bit like a human embryo goes through phases where it looks like anything from a amoeba to a fish to a lizard to a dog to a human, so a basic block will, in its “embryonic” phase, be capable of looking like (and in this case converting into) something very different. Clearly, at the pullback anything is possible. You can turn it into any karate technique that is chambered at the hip. As you start to punch out it can become an inverted punch, a rising inverted punch (age ura zuki), a normal straight punch, a chudan uke, a jodan/age uke – you name it. As you progress further along a particular path the options decrease. So if you’ve cut an angle to achieve a deflection, the technique can still morph or “blend” into either a chudan uke or a jodan uke – or even an open hand hiki/kake uke (which you can achieve by turning the hand over). I cover this in my article “Blending blocks”. But it can no longer convert to a straight punch, for example – the chance for that to happen has passed. And so it is my central thesis that when you look at the essential design of a jodan/age uke or Naha te chudan uke, you simply can’t get an uppercut punch. 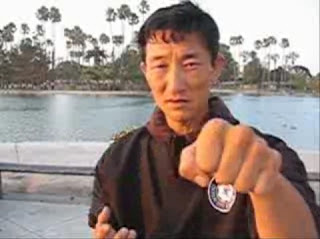 The angle of the initial part of the movement is fundamentally inconsistent with any such punch (unless your opponent is standing diagonally across from you and you punch at an angle across your body rather than turn to face him – an absurd notion, particularly since you’ll want to turn your body for the sake of adding momentum, if nothing else). striking with more force by utilizing the forearm rotation – in which case you have to strike with the weak single bone (the ulna). Either option is fine, if you have no choice. But honestly, I can think of a thousand things I’d rather do than smack someone in the face with my forearm - like use a hammer fist or elbow strike. I discuss this in the "Age uke (secondary movement)" video embedded earlier in this article, particularly from 2:11 onwards. As to the hammer fist "interpretation" of jodan/age uke, it is worth remembering that there simply is no hammer fist strike in jodan age uke (unless you change the nature and angle of the movement substantially to a make a hammer fist, in which case we’re alternately back to “arcane hidden meanings” or, more simply, conversion). There is nothing wrong with the latter – this is simply a process of “conversion” – something fighters face every day in the heat of combat. Basics are, after all, just formal embodiments of essential concepts. These concepts can be blended or totally substituted as the circumstances require. But the essential concept of a basic karate block is that of a deflection – not a strike. There simply is no reason to “reinvent” it as something else, especially when the concept (deflection) works as well as it does. 1. It is worth noting that the rotation of the forearm suitable for a hammer fist strike (ie. turning upon impact) also puts the ulna in position (ie. the hammer fist alignment is the same as the ulna alignment). 2. 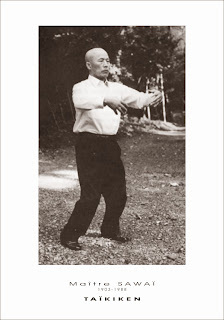 As a matter of interest, taijiquan uses the top, flat part of your forearm offensively, but does so with an augmenting hand, some wrist involvement and body momentum. It is a bumping strike more than a disabling one. This is found in peng and ji. 3. The Naha te hiki/kake uke works identically to the chudan uke, with the exception that your hands are open and turned over. In both cases, you are inscribing an arc at 45 degrees to your chest – as if polishing a platter that is held with its base against your solar plexus and its top angled away from you at eye level. This is the correct angle for the “wax on, wax off” motion seen in the Karate Kid movie! The ulna is the weaker of your 2 forearm bones and is quite unsuitable for striking. This isn’t an issue when it comes to the hammer fist strike because your are striking with the padded end of your clenched fist, not your forearm. However it does illustrate that a “hard block” (ie. one that is geared as a strike) is fundamentally misconceived: It means you are deliberately impacting with your weak ulna. This compares with the rotation of the forearm suitable for blocking where you impact on the forearm using the flat “top” – ie. using both radius and ulna. 4. For crying out loud, I once removed a cork from a wine bottle using a fork (one of my prouder achievements in life). That doesn’t mean forks are “corkscrews in disguise”! Supremely excellent analysis of the situation...you can be sure some people in the striking = blocking tradition are going to take some issue lol. I can see why they might: the science of "soft" deflection isn't easy to understand and takes very dedicated study. But once you have gone down this road, you inevitably understand that, with a stronger, faster opponent who has the benefit of surprise, your only real chance lies in this science. Let me ask you something. Take a look at that video where that prisoner attacked the guard and tell me if you would be able to use any of “ukes” against it? Yes, the guard was caught by surprise but imagine that you were aware of his intentions and managed to position yourself as in your demo videos. And then imagine the guy had a concealed knife or a broken bottle instead of bare hands. Also imagine the attacker is on drugs. How much chance would you have with anything you’ve shown here? Honestly. Now take a look at the video on that Turkish street fighter. How many blocks do you see him make? Honestly? Yes, had the guard been properly trained, an "uke" would have given him a better chance. Look at my article "The flinch reflex". What do you suggest instead? That he might have been able to hit first? Sure - but he didn't. Rightly or wrongly he was surprised and was too late for that. So are you saying that evasion alone might have saved him? Sure -but as I argue in "Evasion vs. Blocking with evasion" why not use both, for safety's sake? Or are you saying he was "doomed" no matter what he did? Honestly. Now take a look at my analysis of the Turkish boxer and note how he uses a deflection without even being trained to do so. To say that the guard was not properly trained is incorrect. You should know that in case of physical contact, law enforcement officers are primary concerned to keep the assailant away from their weapon. The rule is simple: stop the attack, break up the contact, create distance and engage weapons and backup. As we can see, the guard tried to follow up the procedure. He raised his hands to cover his head (that’s also a block) and moved away (evasion). He managed to pull up his pepper spray even after being bombarded by punches. However nothing really helped because nothing of what he did actually stopped the attack at the first place. The assailant kept going after the officer. With that in mind, an “uke”, taken in the sense you present here, would not have given him a better chance because it would not have stopped the attacker from continuing his attack. In fact, had the officer known the attack was coming he would have backed off to create distance and reached for this weapon and called his fellow officers to help him. The only available option for the guard in the situatoin from the video was to counterattack immediately after he realized he was under attack in order to prevent the attacker from continuing his action. Had he moved into the prisoner, instead away of him, for example, the punching would have simply stopped. It would have been risky from the point of the access to his weapon but only if the officer did nothing after that. This brings us to the Turkish boxer. Firstly, how can you say he was using deflections but unaware of it or even being trained for it? It simply makes no sense and even questions the whole point of practicing it. I mean, why train deflections if they come in the place spontaneously as you’re punching? Anyway, there’s no uke there. All that guy did was punching and getting out of the way. He would punch and move away making the assailant go after him which made them drop their guard thus creating a chance for another punch to be delivered. He had enough space to do that and, luckily for him, he didn’t get run over by a car or stumbled over a curb or something. He won, not because of the supposed deflections, but because he prevented attackers from even getting into a position to launch an attack. Let me clear out my stance on this matter. Blocking an incoming limb that is in its full power as shown in your presentation is not realistic. As a matter of fact you don’t want to take that chance because if the attacker is having a concealed weapon your shield may be easily penetrated. If you suspect you might be attacked and let your opponent gets close enough and deliver an unrestrained attack, things happen so fast that there’s simply no time for a well thought block-counterstrike option. So, you do what the Turkish boxer did, attack preemptively when the attacker is not expecting or get out of the way. Never be defensive in the attack zone. I’d like also to mention that your videos, which are supposed to prove your stance on blocking, have an awfully unrealistic setup. It all begins and ends with a single slow punch, which you’re ready for and with your hand guard completely in place. It is clear that the punch is there to meet the block not the other way around. 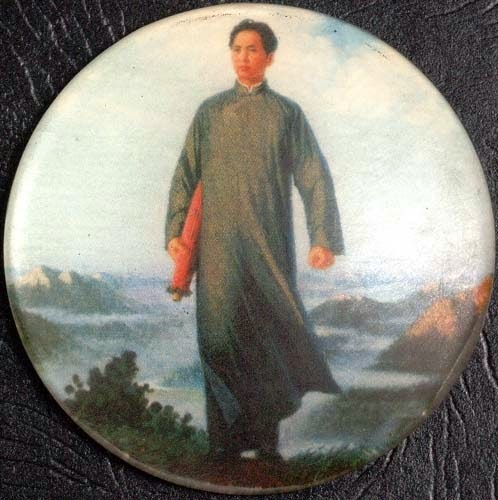 By the way, if you ready for fight and have your guard up, nobody is going to deliver a punch to your head without first making sure the path is clear. And nobody delivers a single strike especially if out of range. It’s a matter of logic nothing else. I wasn't being derogatory about the guards training. I was talking about properly trained in deflections. I know only too well about police and prison officers. I have worked with them for more than 20 years. "He raised his hands to cover his head (that’s also a block) and moved away (evasion)." Yes. But he was not trained in deflection, so the defence did not succeed. "With that in mind, an “uke”, taken in the sense you present here, would not have given him a better chance because it would not have stopped the attacker from continuing his attack." It would have stopped the first punch landing. And, if you read my other blog posts, you would know that uke are accompanied by a counter either "simultaneously" very close to it. "This brings us to the Turkish boxer. Firstly, how can you say he was using deflections but unaware of it or even being trained for it?" I show in my article that one of the defensive responses caused a punch to be deflected and miss. This is what deflections do. Perhaps you don't know this because you have some preconceived (and incorrect) notion about "uke". "It simply makes no sense and even questions the whole point of practicing it. I mean, why train deflections if they come in the place spontaneously as you’re punching?" The untrained flinch reaction naturally comprises (a) and outward extension of the arms to deflect the attack and (b) a withdrawal of the body. 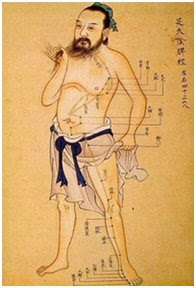 The boxer had a good withdrawal of the body (evasion). In one instance, one of his arm movements actually achieved a deflection (despite his obvious lack of training in that regard). "Anyway, there’s no uke there." Yes, there was. It is how many of my own uke look under pressure. "Blocking an incoming limb that is in its full power as shown in your presentation is not realistic." Why? Because you say so? I have dedicated a good portion of my blog to explaining, in the clearest, most scientific and logical way possible, how they can and do work and are totally consistent with my personal experience, the experience of my family, friends and martial colleagues, and my observations as a prosecutor. Your observations are just bald statements from behind a veil of anonymity. "As a matter of fact you don’t want to take that chance because if the attacker is having a concealed weapon your shield may be easily penetrated." Yes, I suppose you're right. Deflecting an attack using your forearm against his might fail because he has a knife. Better to do what? Let the blow land? Just duck? The guard didn't have time to do that. I'm only too aware of the dangers of weapons. But I'd rather take a cut to the arm than a cut to the face, all out of some dogmatic insistence that "uke don't work", made by some anonymous, rude commentator. "So, you do what the Turkish boxer did, attack preemptively when the attacker is not expecting or get out of the way. Never be defensive in the attack zone." I cover the "late initiative" (ie. defensive) issue comprehensively in relation to the boxer and it is clear that uses defence (predominantly in the form of evasion) in all but the last 3 attacks once he has retreated somewhat and has established some measure of control. "I’d like also to mention that your videos, which are supposed to prove your stance on blocking, have an awfully unrealistic setup..."
It is clear to me that you haven't seen all my videos nor understood their purpose (which is to illustrate discreet points, not to set up "realistic scenarios"). It is also clear to me that, unlike me, you don't post under your own name, with your own videos showing your own abilities such as they are. "It’s a matter of logic nothing else." And propriety. You don't tick those boxes. Accordingly your future posts will be deleted without acknowledgment. Non patiar hanc esse forum pro ignorantia. Osu! Very detailed analysis. Hank you for posting this. It is unfortunate that there are trolls on the Internet. I hope I can add some more reasoned comments. In relation to the uppercut style beginning to the Jodan Uke, I agree that it doesn't work well against straight punches to Jodan as your video shows. However if other hand checks first, (akin to a small Soto Uke, or a boxing style check) this issue doesn't arise. Also, the check is a smaller and faster movement I submit, although the downside is that 2 hands are occupied to block. By checking first, the Jodan Uke becomes more like a bridge/controlling hand/smashing technique. I also submit that the uppercut style beginning is stronger in than the angular one. I agree that the Jodan Uke is redundant as an uppercut, and also there is little need for additional techniques that are variants thereof for stand off strike fighting. 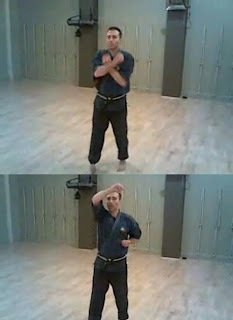 However I beileve that the Jodan Uke as a forearm strike is a useful gross body movement strike to use when grappling. A simple example is toward the end of Pinang Shodan with the Gedan Barai then Jodan Uke. Used against a single lapel grab the 2 blocks as forearm strikes works well, and I submit better than say an uppercut in it place of the Jodan Uke. Another simple example would be as a striking/pressing technique to gain space from side control bottom. Of course it is merely a initial technique to set up an escape, but it is very commonly used and I think very effective. I think in certain instances the chudan Uke is intended to be an uppercut, and this is easier to see if you do a large rotation of the same side hip. In this instance the chudan Uke would not start approx at the other arm elbow (as some use as a reference point) but would go more centrally up the body line. Thank you for the though provoking blog. "In relation to the uppercut style beginning to the Jodan Uke, I agree that it doesn't work well against straight punches to Jodan as your video shows. However if other hand checks first, (akin to a small Soto Uke, or a boxing style check) this issue doesn't arise." I think the angle is still wrong for jodan uke. What you propose is a soto uke + uppercut. That is possible, but it is a completely different technique imho. The angle for a jodan uke is very different to the angle for an uppercut, particularly on the outside, as I demonstrate. "Also, the check is a smaller and faster movement I submit, although the downside is that 2 hands are occupied to block. By checking first, the Jodan Uke becomes more like a bridge/controlling hand/smashing technique." To my mind, what you envisage is a "conversion" from jodan uke to a different combination of moves. 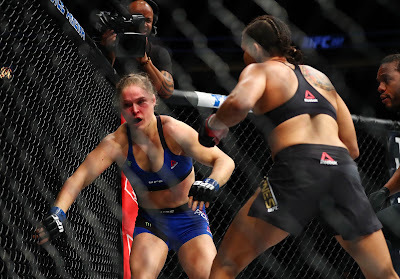 "I also submit that the uppercut style beginning is stronger in than the angular one." Stronger in what sense? Not in terms of intercepting an attack for deflection - particularly on the outside. On the outside a straight uppercut will miss (or contact on the inside, which is less than ideal). 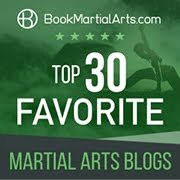 "I agree that the Jodan Uke is redundant as an uppercut, and also there is little need for additional techniques that are variants thereof for stand off strike fighting. However I beileve that the Jodan Uke as a forearm strike is a useful gross body movement strike to use when grappling. A simple example is toward the end of Pinang Shodan with the Gedan Barai then Jodan Uke. Used against a single lapel grab the 2 blocks as forearm strikes works well, and I submit better than say an uppercut in it place of the Jodan Uke. Another simple example would be as a striking/pressing technique to gain space from side control bottom. Of course it is merely a initial technique to set up an escape, but it is very commonly used and I think very effective." To me, you are speaking of very different techniques to the jodan uke. That's fine, but these other techniques already exist on their own. And there is nothing wrong with the jodan uke - it is a fine, even vital, technique imho. 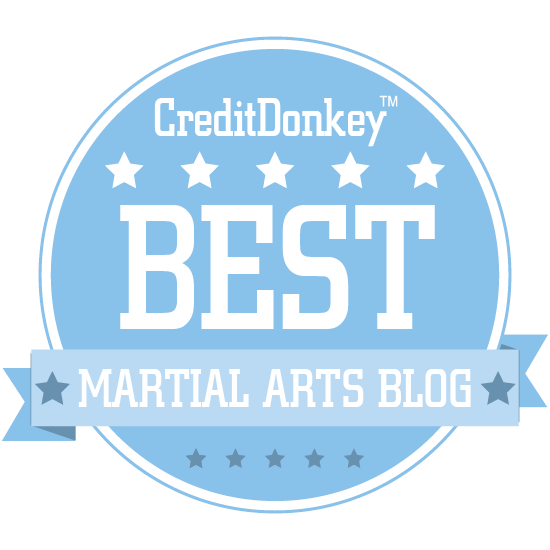 "I think in certain instances the chudan Uke is intended to be an uppercut, and this is easier to see if you do a large rotation of the same side hip. In this instance the chudan Uke would not start approx at the other arm elbow (as some use as a reference point) but would go more centrally up the body line." Again, you are talking about appropriating the chudan uke movement for other purposes - ie. converting it. I regard chudan uke as one of the most useful techniques around. I see no reason to see it as an uppercut - I leave that to uppercuts (which I already practice on their own)!